Epsum factorial non deposit quid Egyptian Maus arrived in the UK in late 1998. The Egyptian Mau Club had its inaugural meeting at the National Cat Club Show in December 1998 and has been dedicated to the development of the breed in the United Kingdom as well as its recognition and promotion to Championship Status by the Governing Council of the Cat Fancy. The Club has been affiliated to the GCCF since 2003, and, following its success at Preliminary Status, the breed was promoted to Provisional Status from 1st June 2004. Breeders and exhibitors then worked hard to qualify sufficient cats with three Intermediate Certificates to move to our final goal ' Championship Status for the Mau ' and that will be the case from June 1st 2007 ' the hard work and commitment paid off! that bears a striking resemblance to the statuesque spotted cats depicted in Ancient Egyptian art. 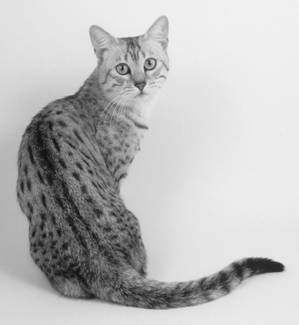 The GCCF standard describes the Mau as follows: "The Egyptian Mau is an elegant cat of moderate, foreign type characterised by a random spotted pattern seen both in tabby and smoke colours, and a unique "worried" look. This facial expression is generated by large, straight-set gooseberry-green eyes beneath a level brow and between the parallel lines of the nose. The Mau is an active, well-balanced, medium-sized cat with a strength and hard muscular feel that belies its graceful build. Males tend to be larger than females." As a guide on weight, adult females usually weigh between 3-4 kilos whereas males are from 4-6 kilos on maturity. It is important though to be careful with the diet, as neutered Maus can really become quite large, blurring their elegance. Maus registered with the GCCF are given a specific breed number, Silvers are 78 30s, Bronze 78 30 and Smoke 78 36. Maus were first brought into this country, from the United States, by Dr Melissa Bateson. Melissa was first attracted to the breed when, at the age of 10, she saw a photograph of Maus in a book, and, from that point on, knew that was the breed she wanted to own. Melissa was attracted by a combination of the exotic spotted pattern and the unique facial expression that has variously been described as "worried" or "concerned". The photo was black and white but the colour descriptions were unusual and interesting too, with names like "silver", "bronze" and "smoke". Finally, the history of the breed sounded so romantic! The last remaining Maus were rescued in Italy by a Russian princess and taken to North America where she, with a group of interested breeders founded the modern Mau. I was first attracted to the breed when they were on exhibition at the Somali Cat Club's Show in March 1999. I was, like Melissa, enchanted by their pattern and those large, expressive, gooseberry green eyes. 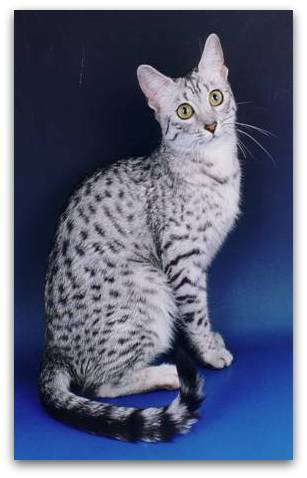 I really wanted a silver Mau from the handsome CFA Grand Champion Sharbees Mihos of New Kingdom and suggested to my husband we should book a female from Melissa's next litter. He agreed, as long as I purchased it (knowing I never had any savings in the bank! ), however, a few weeks later, an unexpected insurance policy matured and my wish came true! Newkingdom Tamyt has a wonderful personality and has produced some beautiful and successful kittens for us too ' Beaumaris Maus are very much a part of our household. The colouring and markings of the Mau are very striking and always attract visitors at shows. The breed is characterised by its spotted tabby pattern. Spots can be any size or shape. They come in three colours accepted for showing: silver (silver ground colour with charcoal grey or black markings), bronze (really warm coppery, brown ground colour with darker brown or black markings) and smoke (this appears as dark, charcoal grey with jet black markings however each hair is in fact silver at the base and tipped with black). 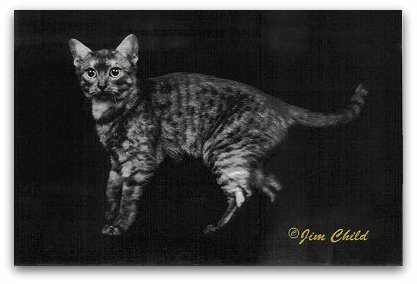 The markings on the smoke are a "ghost" tabby pattern where breeders have deliberately selected those with a clearly defined pattern to breed from. The Mau is the only breed to have a patterned smoke. The colours not accepted for showing include solid black, but Maus also occur in dilute colours giving a blue silver, blue tabby, blue smoke and a solid blue. No dilute Maus have been born to date in the UK. Maus can also sometimes occur in the blotched or classic tabby pattern, theoretically possible in all of the above colours. Classic tabby Maus can neither be shown nor bred from, but make excellent and very beautiful pets. They are relatively common in the UK. The Egyptian Mau Breed Advisory Committee currently has no intention to develop or recognise any new colours or patterns. Smoke Maus are unique in that they have been deliberately bred to show their spots. The more contrast there is, the better the pattern. Another feature of the Mau is their beautiful large, rounded almond eyes - gooseberry green in colour, they have a worried expression that is very endearing. Maus are intelligent, active and very playful cats. They love toys, and many learn to retrieve as they really enjoy interacting with their owners. They are reputed to have the fastest reflexes of any domestic cat, and are formidable hunters if allowed outside. Maus generally get along very well with other animals including dogs. They bond strongly to their owners, but are sometimes, initially, shy of strangers. They are very intelligent and stubborn cats. They learn fast and like to have their own way. They can open doors, cupboards and drawers and love to investigate anything new. with fewer than 200 kittens being registered with the GCCF each year. The breed benefited from the publicity provided by the recent "Catwoman" film that starred an Egyptian Mau (well, there were three Maus playing the role and it was part of the fun of the film to recognise where the cats swapped scenes) as well as Halle Berry who, it was reported liked the breed very much! 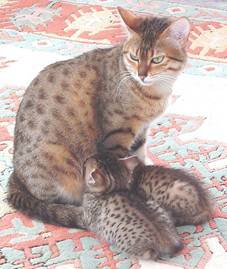 A charming picture of a bronze Mau, Chantina Sahara, with her beautifully marked bronze kittens. Maus are very good mothers as this print clearly shows.